Forbes magazine has named Pinnacle Financial Partners financial advisor James Hare as a “Best-In-State Wealth Advisor” for Tennessee. Hare earned the No. 23 spot on the list, which ranks more than 2,000 top-performing advisors from across the country. This is Hare’s first appearance on the list. He was previously honored by Bank Investment Consultant magazine in late 2017 as No. 20 on its list of Top 100 Bank Advisors. The Forbes ranking is based on an algorithm of qualitative criteria and quantitative data. Advisors considered have a minimum of seven years of experience, and the algorithm weighs factors like revenue trends, AUM, compliance records, industry experience and those that encompass best practices in their practices and approach to working with clients. Bobby Edwards and Lisa Morgan have joined Pinnacle Financial Partners as senior vice presidents and financial advisors. Edwards comes to Pinnacle after 23 years with SunTrust Bank (Third National Bank) serving the Middle Tennessee area. After leading two branch teams in Woodbine and Belle Meade, he spent the last 10 years leading the Nashville-area branches including Williamson, Sumner and Robertson Counties. Edwards also spent two years as the Licensed Banker Program manager for Middle Tennessee and North Alabama. He earned his degree in business administration from Welch College in Nashville. Morgan has spent 18 years working at SunTrust Bank in Nashville, where she served as a branch manager and business banker. She is based at the firm’s Bellevue office. The Jones Company, a Nashville-area home builder, has hired Amanda Hardin as sales manager. Hardin returns to The Jones Company after spending seven years with Goodall Homes as a new home consultant. Hardin previously served as the sales manager 2003-2011 for The Jones Company. She is a National Association of Home Builders Certified New Home Sales Specialist and National Association of Realtors Certified Sales Professional. Since 2004, Hardin has won several awards of excellence from the Sumner Association of REALTORS. She also is a platinum award winner of the Home Builders Association of Middle Tennessee Sales and Marketing Council Circle of Excellence. 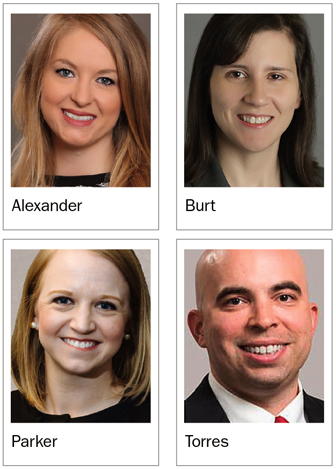 Diversified Trust, an independent comprehensive wealth management firm with more than $6.5 billion in client assets under management, has announced the promotion of 10 staff across the Southeast, including five in Nashville: Brittany Alexander, Joanna Burt, Marta Parker, Alan Torres and Michael L. Winter. Alexander, promoted to senior associate, works with the operations team and supports the corporate operations group. She also provides broad administrative and operational support for the firm’s four offices. She is a graduate of Western Kentucky University. Burt, promoted to senior associate, serves as a member of the corporate operations team. She also provides support for all operational functions across the firm. Burt holds a degree in accounting from Mount Vernon Nazarene University. Parker, promoted from senior associate to vice president, focuses on serving individual clients. She graduated from the University of Tennessee with degrees in business administration and accounting, and earned a master of accountancy from Belmont University. She is a Certified Public Accountant. Torres, promoted from senior associate to vice president, is primarily focused on system administration and support of Diversified Trust’s information technology. He earned a degree in business administration from the University of North Alabama. He has 11 years of combined experience in information technology, primarily in financial and legal industries. Winter, promoted from senior vice president to principal, serves as chief operating officer. He is a member of the portfolio management team and graduated from Virginia Tech with a degree where he majored in finance. He a CFA charterholder and member of the CFA society of Nashville. Ellie Westman Chin, president and CEO of the Williamson County Convention and Visitors Bureau, has been named to the U.S. Travel Association Board of Directors. Nominated by Fred Dixon, president and CEO of NYC & Company, and approved by the US Travel Association Board of Directors, Westman Chin will serve as an at-large delegate for a two-year term. The U.S. Travel Association is the national, non-profit organization representing all components of America’s travel industry, which generates $2.3 trillion in economic outputs and supports 15.3 million American jobs. Westman Chin has served as president and CEO of the Williamson County Convention & Visitors Bureau since July 2014. In that time, Franklin and the communities of Williamson County have evolved into a year-round destination known for a unique blend of music, history and southern culture. During Westman Chin’s tenure, she has helped spearhead development initiatives that have set the WCCVB up as a local, regional, and national leader in the tourism industry. The Council on Aging of Middle Tennessee elected a new board with the Rev. Dr. Richard Gentzler, Jr. as its new president and Chris Puri as vice president. Hertha Hines and Nancy Conway, both of Williamson County, have been added to the board. The newly elected members join 11 returning board members and five officers dedicated to the advancement of COA’s mission to address the unmet needs of older adults and caregivers through information, advocacy and education, and by being a catalyst for comprehensive solutions. Citizens Savings Bank & Trust has appointed healthcare executive and attorney Richard Manson as chairman of the board following the retirement of chairman Dr. T.B. Boyd III. The chairman provides leadership for the effective governance of the bank and provides guidance for the accountability to shareholders, regulators and other stakeholders. Manson has an abundance of international experience and knowledge in understanding the markets and cultures throughout North America, Asia and Africa. Boyd is now chairman emeritus. Originally from Dayton, Ohio, Manson is a corporate leader who builds and brokers relationships to create profitable, lasting and mutually beneficial business partnerships. He earned a degree in history from Fisk University and was the recipient of the Thomas J. Watson Fellow to study abroad. He holds a Juris Doctorate degree from Vanderbilt University Law School. Surgery Partners, Inc., a health care services company, has appointed Angela Justice, Ph.D. as the company’s chief human resources officer. The role was created in line with Surgery Partners’ long-term growth strategy and commitment to employee development. Justice will lead the human resources department and play a critical role in advancing the company’s growth objectives and developing its human capital. She has more than 15 years of experience in health care and human resources leadership. She most recently served as chief learning officer at Biogen, Inc., an American multinational biotechnology company based in Cambridge, Massachusetts. Justice has held leadership roles at EMD Serono, the National MS Society and was a management consultant at McKinsey & Company. She earned her Ph.D. in biopsychology from the University of Chicago, where she was also an adjunct faculty member. Nashville-based entertainment & publicity firm StarPro PR has promoted Cynthia Aycock to head up the company’s in-house radio promotion team. Aycock previously held the position of associate publicist and office support specialist at StarPro PR. StarPro PR is a full-service marketing, publicity and radio promotions firm specializing in publicity & brand management for the entertainment industry. The Tennessee Economic Development Council has recognized Bill Shuff as a recipient of the Legacy Award. Shuff began his economic development career in 1969 while working with the Governor’s staff for industrial development for Governor Buford Ellington. He later went on to work with the Middle Tennessee Industrial Development Association and as executive director of the Southern Industrial Development Council. He has played an integral part in the successful growth of the region over the nearly four decades.